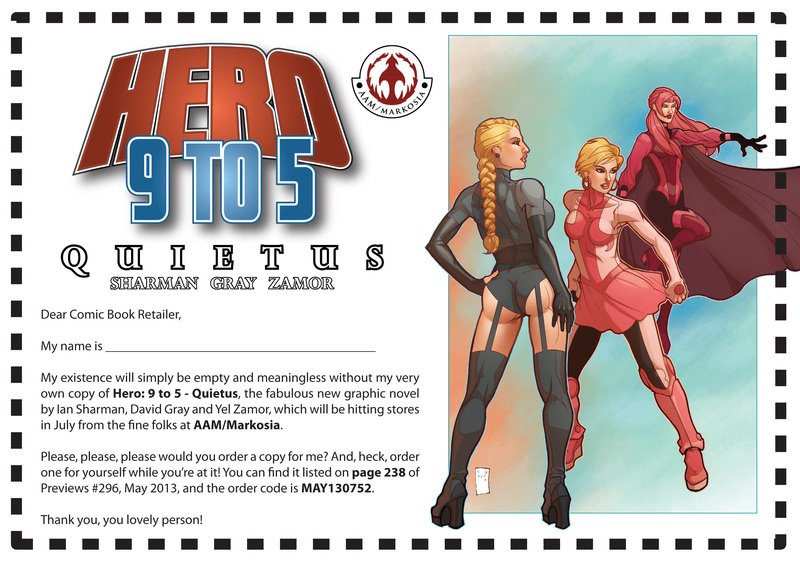 Hero: 9 to 5 – Quietus is now available to pre-order from your local comic shop! Read a free preview of the book here, and an interview with Hero: 9 to 5 writer and creator Ian Sharman here. Please note: Due to the nature of the comic book industry, pre-ordering is essential to ensuring that you get a copy of the book. Please do not simply assume that your local comic shop will be ordering the book anyway, as it’s highly likely that unless you tell them you want it they won’t order it at all. Where to pre-order Hero: 9 to 5 – Quietus online! Pre-Order Hero: 9 to 5 – Quietus! You have until May 18th to pre-order Hero: 9 to 5 – Quietus from your local comic shop. If you want a copy then please don’t just assume your retailer will order it in and you’ll just be able to pick it up when you see it on the shelf in July, because odds are that you probably won’t. If you want it, preorder it. Preorder it now. Alternatively, order it from your regular online retailer, such as Forbidden Planet. Hello everyone! 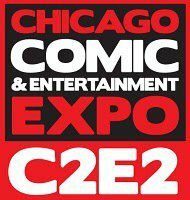 Ian Sharman, creator of Alpha Gods, Hypergirl and Hero: 9 to 5 will be at table D7 in the Artist Alley at C2E2, from 26th to 28th April. So come on down and say hello, it’s always nice to meet our fans! New Alpha Gods and Hero: 9 to 5 on Comixology! Also, get the complete first Hero: 9 to 5 graphic novel on Comixology for just $2.99/£1.99 here. Buy the Hero: 9 to 5 – Quietus LSCC Exclusive Preview Edition for £5 and get a copy of the Eagle Award Nominated Eleventh Hour Vol 1 for FREE! LSCC Special Offers – Alpha Gods: Emergence reduced from £9.99 to just £5! Shrapnel: Case Files #1 reduced from £4 to just £2.50! NEW RELEASE! Elemental Micah by Michael Georgiou for just £10! FREE COMICS! We have a small number of comics that we’re giving away ABSOLUTELY FREE! First come, first served! Once they’re gone, they’re gone! And David Wynne will be sketching at the booth all weekend! Get a sketch for just £5! He’s also selling prints for £10 and original art from just £20! So swing by Booth B4 at the London Super Comic Con this weekend for these and many other great buys from Orang Utan Comics! 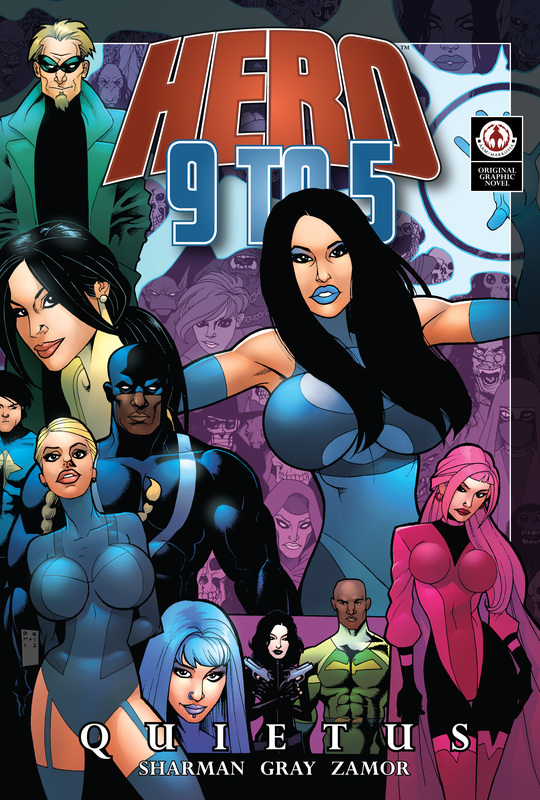 Hero: 9 to 5 – Quietus LSCC Preview Edition now available to pre-order online! You can now pre-order the Hero: 9 to 5 – Quietus LSCC Preview Edition for pick up at the show or for mail order delivery from our online store. Please read the notes thoroughly before ordering! This is a strictly limited edition run of 100 copies! First come, first served!